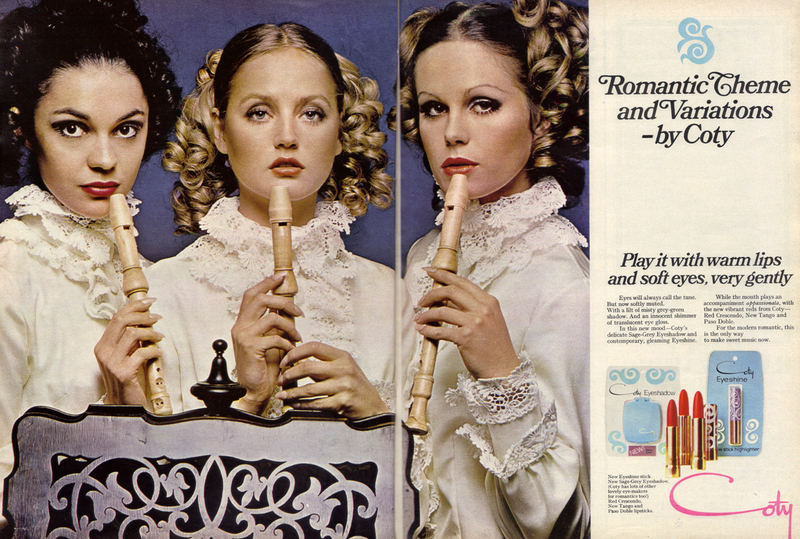 I apologise to the beauty on the left, I don’t know her name, but lovely to see another early shot of the divine Miss Joanna Lumley and, of course, the beautiful Ingrid Boulting. In the Fifties a trip to the hairdresser’s was a daunting ordeal – for you and for each hair on your head. Vidal Sassoon changed all that in 1964, and substituted the welcome breeziness of the blow-drying second-generation stylists. Who are the other top hairdresses, and who goes to them? There are no credits for the clothes, but I think Marianne’s glorious ensemble must be a Bill Gibb, and Sian Phillips’s elegant coat looks like a John Bates to me. Such a glorious array of celebs, I think Michaeljohn win on numbers (but Ricci Burns really ought to win, purely because of the way his ladies are dressed!). 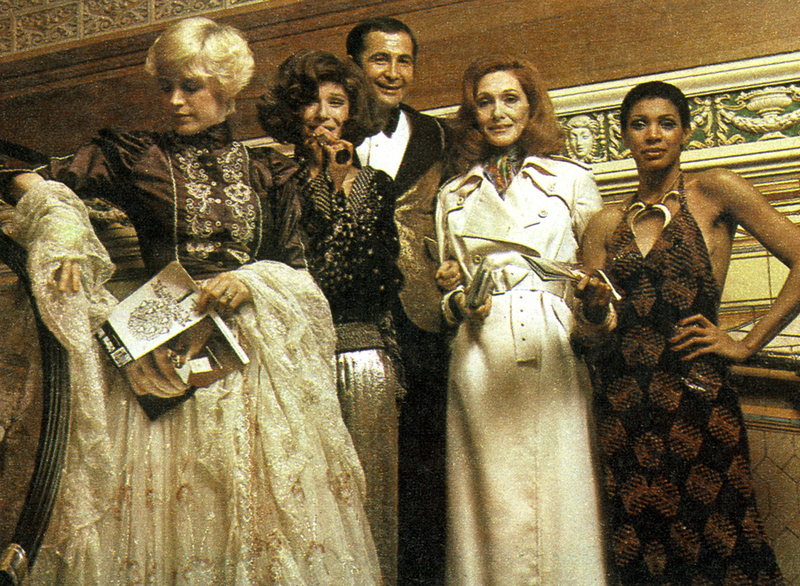 At Ricci Burns: Marianne Faithfull, Fenella Fielding, Ricci Burns, Sian Phillips, Brenda Arnaud. Ricci started in hairdressing at the age of 15, worked for Vidal Sassoon for ten years and opened his own salon in the King’s Road five years ago. Now has a second salon in George Street, and did have one in Marrakesh “until the coup, darling”. 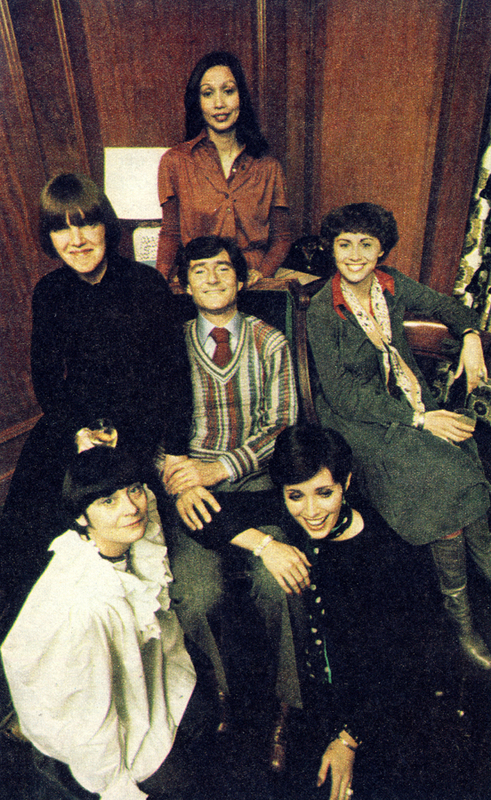 At Vidal Sassoon: Lady Russell (back), Mary Quant, Vidal Sassoon and Kate Nelligan (centre). Shirley (Mrs Ken) Russell, Beverly Sassoon. 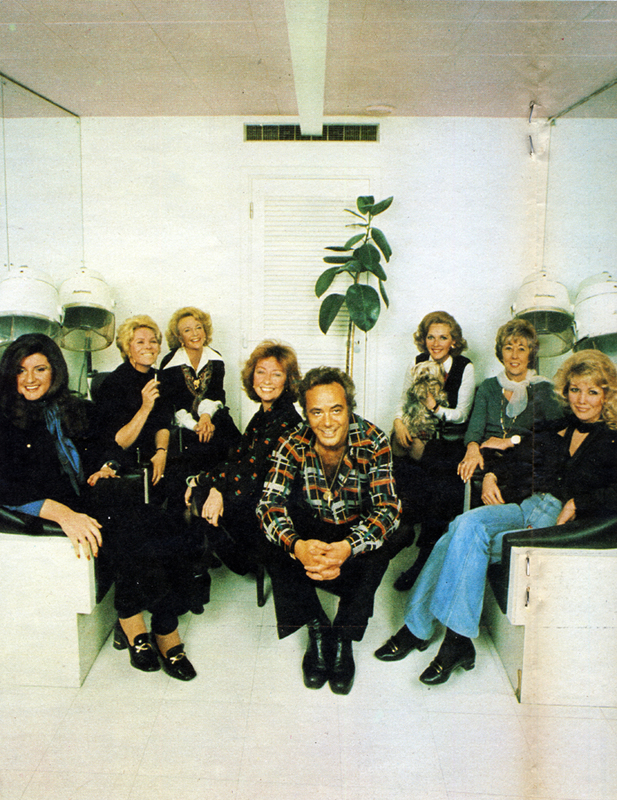 At Michaeljohn: Back row, from left: Jean Muir, Britt Ekland, Joanna Lumley, Joan Collins and her daughter Sasha, Tom Gilbey, Gina Fratini and Diane Logan. Front: John Isaacs and Michael Rasser (one time colleagues at Leonard), who started Michaeljohn in 1967. 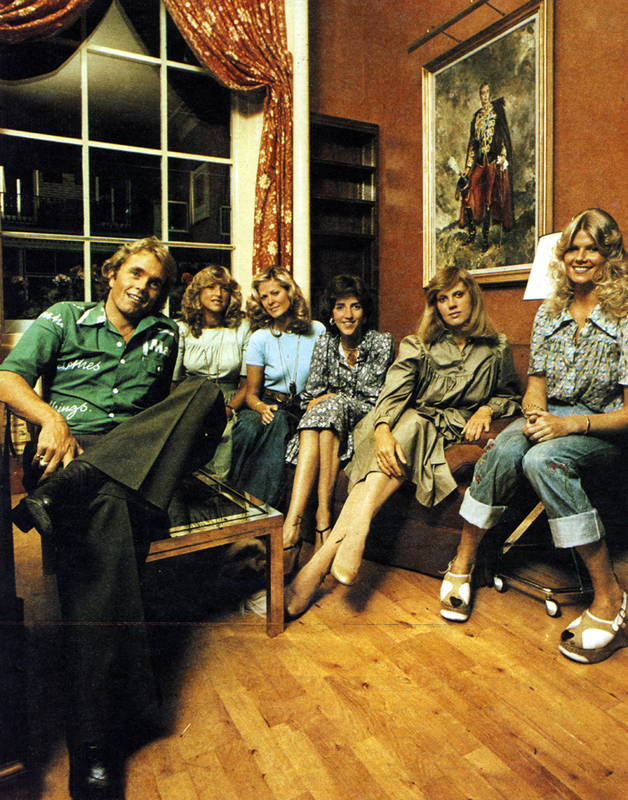 At Figurehead: George Britnell, proprietor, with clients (from left) Catherine Parent, Kari Lai, Lady Charles Spencer Churchill, Tessa Kennedy, Lady Charlotte Anne Curzon. This is the newest salon of them all – it opened in Pont Street this year. 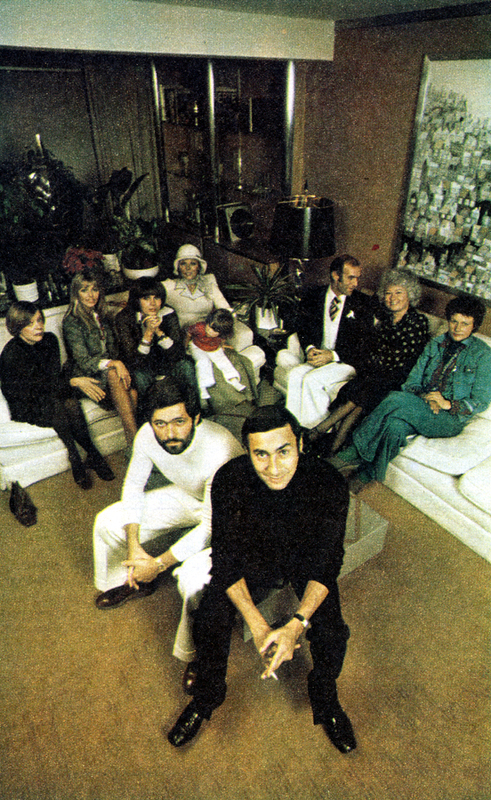 At the Cadogan Club: (from left to right) Ariana Stassinopolos, Rachel Roberts, Moira Lister, Patricia Millbourn and Aldo Bigozzi (partners), Katie Boyle, Joan Benham and Annette Andre. Ciné Revue, 23 Janvier 1969. I am going to roughly translate that as Phwoar!! Check out the new James Bond’s bevvy of dollybirds*, to use contemporary British terminology. I realise that Mr Lazenby really isn’t much cop as an actor, but a) he isn’t Sean Connery (who brings me out in hives) and b) On Her Majesty’s Secret Service has the glorious Ms Rigg in it, so no criticism is allowed chez Vintage-a-Peel. 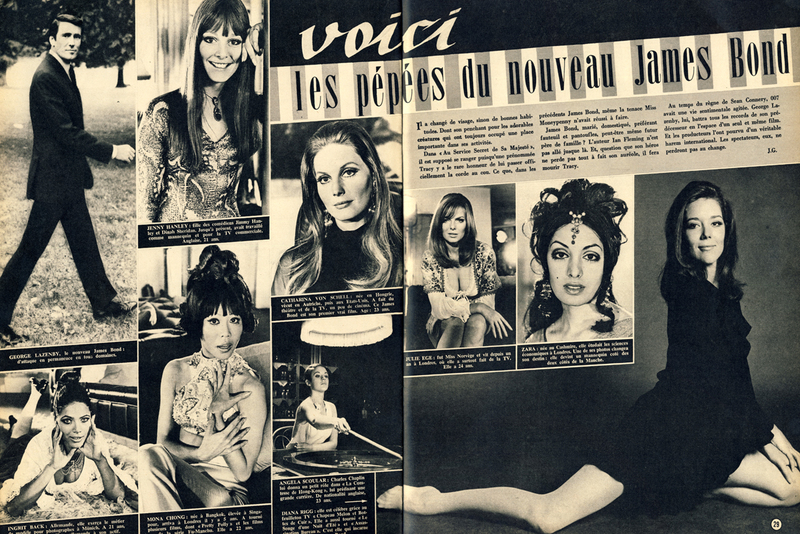 A great spread from Ciné Revue featuring all the key Bond girls in OHMSS (special mention for Angela Scoular), but weirdly omitting Joanna Lumley. Ah well, enjoy! I have just listed some stunning new pieces over at Vintage-a-Peel, but the real star of the show has got to be this incredible Lee Bender for Bus Stop skirt and halter top set. 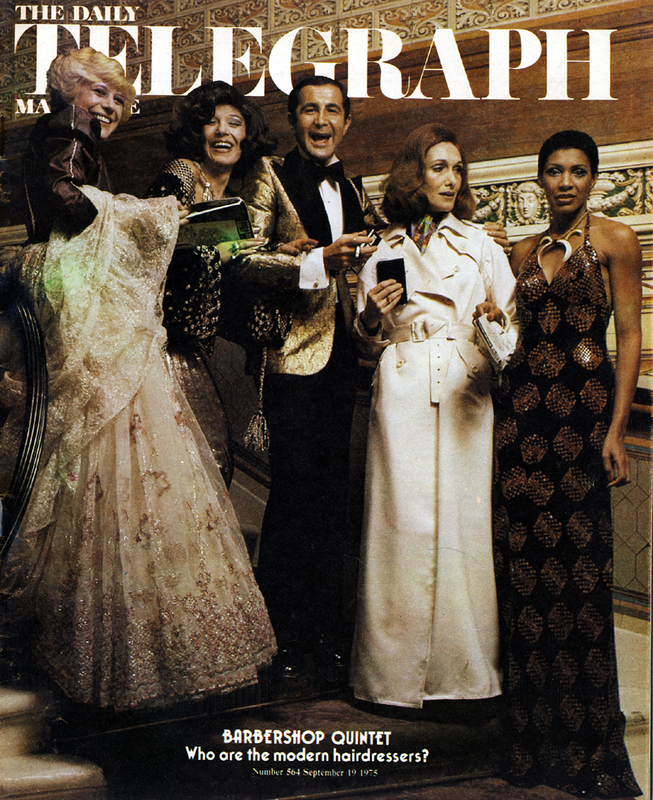 For it is identical to the one worn by Joanna Lumley in a photocall for The New Avengers in 1976. Deliciously bright and saucy, and the one thing which might distract the world from your pudding-bowl haircut! It’s of the greatest frustration to me that nobody has yet bought this beautiful skirt by Catherine Buckley. 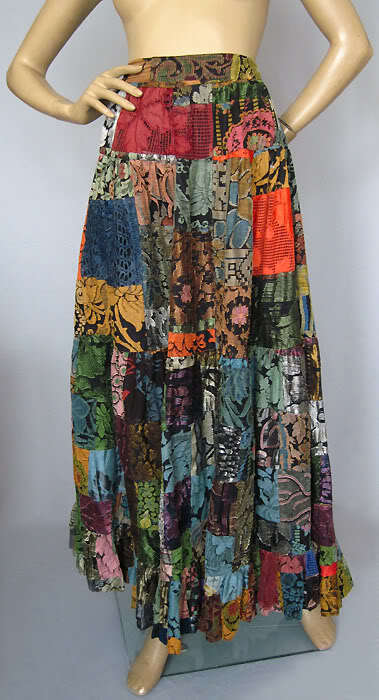 Made from antique fabrics, patchworked into a maxi skirt, it is a key piece of this designer’s work and a beautiful garment to behold. I knew she had designed clothes for Joanna Lumley as Purdey in The New Avengers, but it had been so long since I watched the episodes, I didn’t remember many individual outfits. Even so, it was highly unlikely that the super-active Purdey would have been wearing a patchwork maxi skirt. Or so I thought. Seems Ms Buckley designed a split midi version for the episode ‘House of Cards’ which Joanna wears to perfection in an action sequence. Here are some stills, and here is a link to the skirt. Buckley’s work is rare enough, and these patchwork pieces even rarer. Spotting old Joanna Lumley modelling shots could become an addictive pastime, and yet I keep forgetting to scan them in when I see them. No longer! From October 1968. 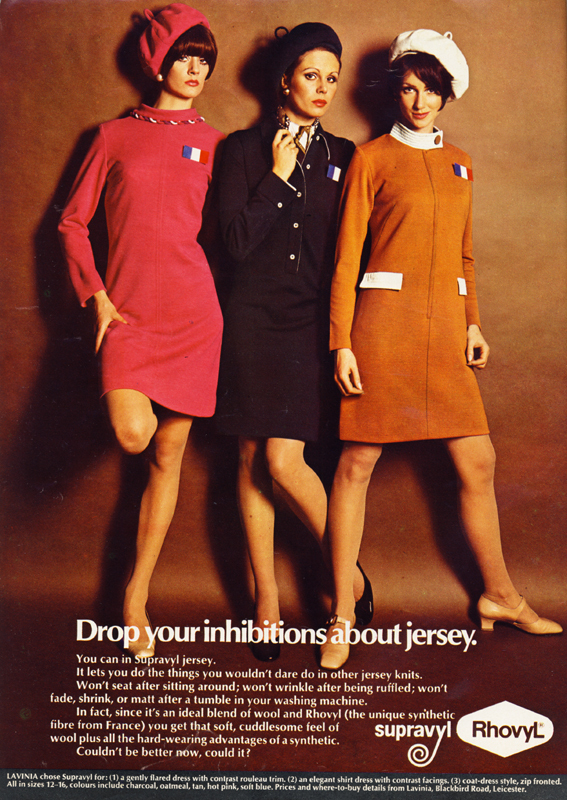 I’m not sure I know anyone who has inhibitions about jersey, but perhaps it was a big social problem in the 1960s? Scanned from Jean Muir (exhibition book from 1980) by Leeds Art Galleries.